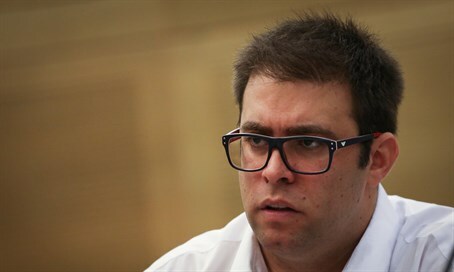 The Knesset's Constitution, Law and Justice Committee on Tuesday passed in a first reading a new law by freshman MK Oren Hazan (Likud), establishing the country's name as the "State of Israel" and further confirming its flag, symbol and anthem. "The law was born in my mind on the seminar day held for the new Members of Knesset. MK (Yousef) Jabareen asked where is it written that this is the state of Israel? And then it was made known to me that the name of the state is not anchored in law," said Hazan, referencing an Arab MK of the Joint List party. "An investigation I conducted found that in the days of the establishment of the state there was a debate about how to call the state, and the name 'Israel' was decided. In the Declaration of Independence it was decided that the name would be anchored in law. However, that never happened." "The current situation allows any MK to sign their name as a member of the Kingdom of Palestine," noted Hazan. "It is fitting and correct to anchor in law the name of the state, the anthem and the flag." Hazan argued that the courts have made the Declaration of Independence merely "declarative" in nature, without legal weight. MK Nissan Slominski (Jewish Home), head of the Constitution Committee, said, "I'm doubtful whether it is possible today to anchor the Declaration of Independence in the law. The Basic Laws determine that the state of Israel is a Jewish and democratic state, but the Supreme Court interprets the law in far-reaching interpretations, causing the reference to 'Jewish' to disappear." The bill was unanimously approved in the first reading at the committee on Tuesday, and will now be brought for a vote at a Knesset plenary session.